This spacious, modern, well kept complex of one bed apartments is approximately 10 minutes walk from the bustling main promenade of Puerto del Carmen. It is therefore ideal for those who prefer to be near to the amenities, but also like to sunbathe and relax in the peaceful atmosphere around any of the four swimming pools. 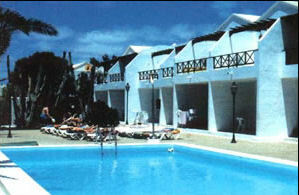 There is also a supermarket situated within the complex, which is very convenient for guests. The one bed apartments sleep up to 3 people. They consist of a fully-fitted kitchen with fridge, electric hob, toaster, kettle, iron and breakfast bar. There is also a lounge and a twin bedroom. The apartments also have one bathroom and either a terrace or balcony. 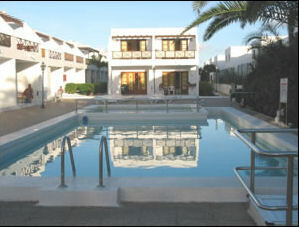 Puerto del Carmen is Lanzarote's biggest and busiest resort and is situated on the south-east coast of the island. As well as year round sun, the resort offers a wide selection of daytime and nighttime activities and entertainment to suit people of all ages and all tastes. The seaside promenade Avenida de las Playas follows the coastline of Puerto del Carmen (and Lanzarote's longest beach) for several miles, with it's low-rise apartments, restaurants, shops and bars.